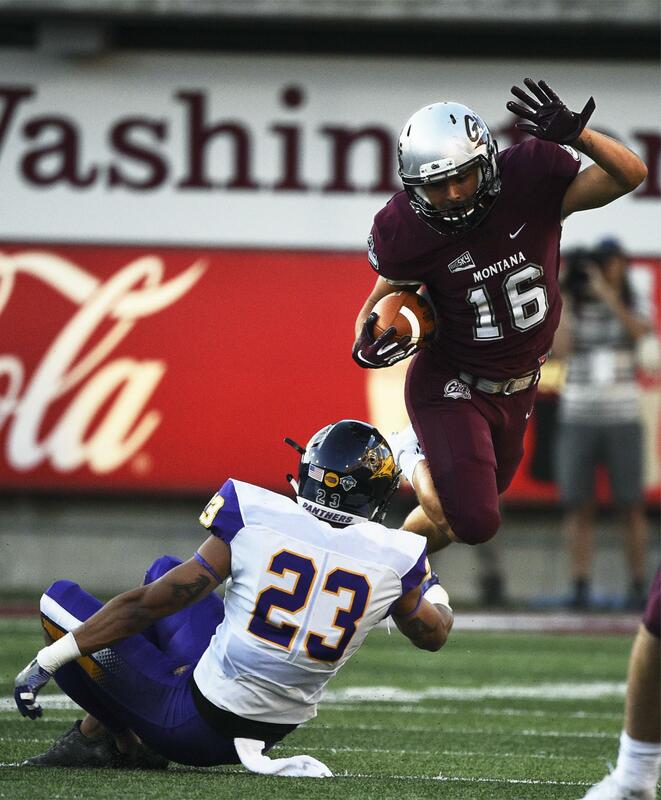 UPDATED: Sat., Sept. 8, 2018, 11:05 p.m.
Dalton Sneed fired two touchdown passes 22 seconds apart and added a scoring run as the Montana Grizzlies pulled away from Drake 48-16 on Saturday in Missoula. Sneed, a junior quarterback, threw scoring passes of 13 and 10 yards to Jerry Louie-McGee (Lake City High) and Samuel Akem in the final minute of the third quarter. Akem’s touchdown, with 22 seconds left in the quarter, came one play after an interception and 25-yard return by Grizzlies safety Reid Miller, and made it 31-10. Tailback Adam Eastwood added two scoring runs, including a 37-yard burst as the Grizzlies (2-0) pulled away from a 10-3 halftime lead. South Dakota 43, Northern Colorado 28: Austin Simmons threw for 462 yards and four touchdown passes, and ran for another score, as the Coyotes held off the Bears in Vermillion, South Dakota. The Coyotes (1-1) rebounded from their 27-24 loss at Kansas State for its 16th consecutive home-opening win and 40th opener at the DakotaDome. South Dakota State 45, Montana State 14: Taryn Christion passed for four touchdowns and ran for another and Cade Johnson tied South Dakota State’s single-game record with four TD receptions to help the Jackrabbits beat the Bobcats in Brookings, South Dakota. Christion was 21-of-29 passing for 319 yards and Johnson finished with nine receptions for 138 yards. San Diego State 28, Sacramento State 14: Juwan Washington ran 36 times for 156 yards and a career-high three touchdowns, and the Aztecs scored 15 points in the fourth quarter to beat the Hornets in San Diego. Washington’s 4-yard TD run capped a 13-play, 82-yard drive with 4:05 left in the game, giving the Aztecs (1-1) the lead for good. Weber State 24, Cal Poly 17: Josh Davis ran for 177 yards and two touchdowns, and the Wildcats forced a late turnover and held off the Mustangs in San Luis Obispo, California. Weber State (1-1) has won three straight games against Cal Poly (0-2). UC Davis 54, San Diego 21: Ulonzo Gilliam rushed 16 times for 46 yards and three touchdowns as the Aggies routed the Toreros in Davis, California. Published: Sept. 8, 2018, 9:12 p.m. Updated: Sept. 8, 2018, 11:05 p.m.